As most already know, October is Breast Cancer Awareness month – a whole month dedicated to raising awareness of breast cancer and helping to raise money for the many wonderful charities that support the research and those affected by it. 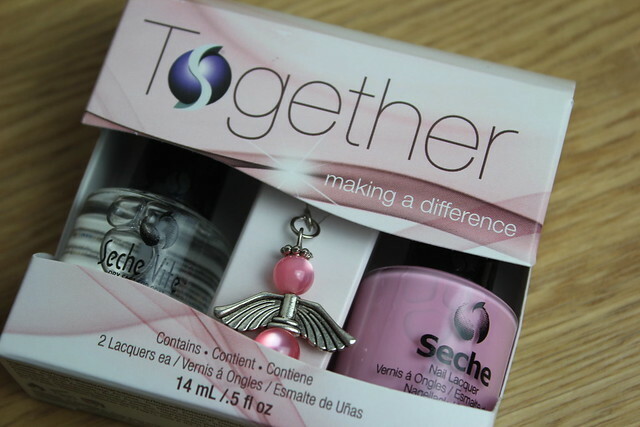 It also means a flurry of pink products hitting the beauty market to help do their little bit in the way of raising funds – one of which being the ‘Together Making a difference’ duo from Seche. The together set is a little duo of the classic Seche Vite top coat – almost certainly my number one repeat purchase, don’t know how I did my nails without it, product. Plus the pretty pink shade ‘delicate’ plus a little add of of the pink beaded angel charm key ring. 10% of the proceeds go towards the breast cancer charity ‘Future Dreams’. The duo is priced £14.99 – which is also amazing value as the single bottle of each would set you back around £10 – it’s also reduced on Beauty Bay at the moment so quite a bargain. Aw bless, how cute 🙂 lovely post !